Google Adds Latin Translation: Now You Can Swear in a Dead Language! While I did have to take Latin in 7th and 8th grade, most of it has either been stashed away deep in the recesses of my brain or forgotten. Probably the latter. 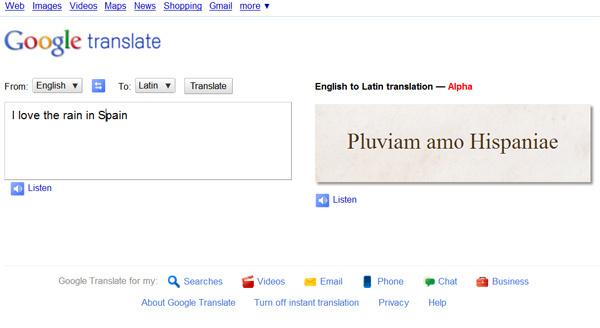 However, I really like the fact that Google Translate can now translate into Latin, which is considered a dead language. It’s probably of limited use for most of us, but I’d also like to see Ancient Greek, and other dead languages in Google Translate. It’s important to keep these languages alive in some form. Plus, you can get all these crazy swear words in Latin, and translate all those Latin sayings that you find on your dollar bills and whatnot. Maybe the kids will start using Latin again instead of the shortcodes they use in all their text messages.